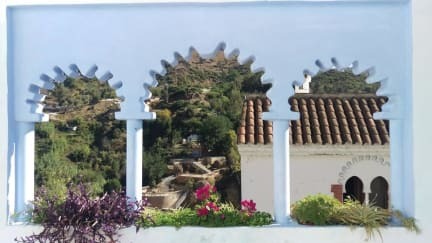 Hostal la Joya i Chefchaouen, Marokko: Reservér nu! We want to make sure that you will feel at home during your stay so we can not only help you here at Hostal la Joya, but also if you want to plan any visit to the city! We can recommend restaurants and shop and make sure that you make the most of your visit! Hostal la Joya is situated between the New Town and Old Town, at 10 meters citadel (historical monument of the medina, 50 meters from suika (ancient streets co bazaars, shops artezania 150 meters from the famous waterfall coming out of mountain. The hostel is located in a pedestrian street and it is very close to the main square 30 meters (outa hammam) where bazaars, restaurants, coffee shops, tea shops) eye, send our customers to the best sites, retaurants, cafeterias. Check in from 11:00 to midnight.